My first attempt at solo-canning was victorious! 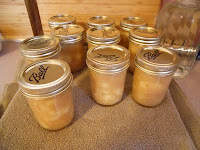 I now am the proud owner of ten jars of ginger-pearsauce - applesauce only made with pears + a ginger kick for intrigue. Yummm. When do I get to taste it?